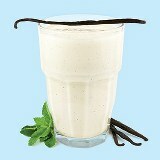 A creamy, thick and terrific tasting vanilla shake. Fill to the line with water, shake and go! Great for travel.